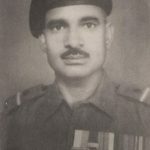 Subedar Chuna Ram was born in the year 1923 in the village Dalmas Ki Dhani, Sikar. He was son of Mr Biru Ram Fageria and Mrs Kisani Devi. His brothers were Hardeva Ram, Khuma Ram, Kheta Ram, Pokhar Mal. He also had five sisters; Kasturi, Parmeshawari, Chhoti, Anchi and Kanchan. He was married to Chandari Devi. Sub Chuna Ram’s sons are Puranmal, Ramratan, Hanuman and Rajendra Prasad. He was enrolled in the Indian Army on December 29th 1940 in 2nd Rajputana Rifles and subsequently rose to the rank of Subedar. 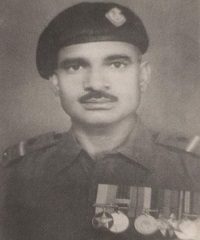 Sub Chuna Ram was the first winner of Mahavir Chakra in 1948 in Indo-Pak war. On June 1948 a company of 2 Rajputana Rifles was ordered to dislodge the enemy from the hills overlooking the Rajouri Thana Mandi Road, in Kashmir. Sub Chuna Ram, the Commander of the reserve platoon of the company was asked to silence the guns on the spur. Chuna Ram moved up with two sections of his platoon. When they neared the objective, the enemy lobbed hand grenades at them but that could not stop Chuna Ram. He charged the enemy post with a sten gun. He killed two and wounded three enemy soldiers and silenced the guns. He was bleeding profusely from his wounds but continued to fight till he became unconscious. 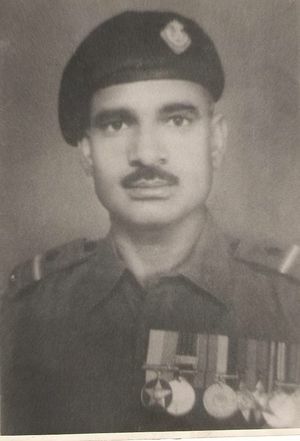 Sub Chuna Ram was given the nation’s second highest gallantry award, ” Maha Vir Chakra” for his exceptional courage, determination and devotion to duty. Havaldar Chuna Ram Fageria was awarded MVC on June 15, 1948 for capturing of PT 5460 during J & K Operations in Poonch & Raujori area. In June 1948 a company of 2 Rajputana Rifles was ordered to dislodge the enemy from the hills overlooking the Rajouri-Thana Mandi Road, in Kashmir. Havildar Chuna Ram, Commander of the reserve platoon of the company was asked to silence the guns on the spur. The havildar moved up with two sections of his platoon. When they neared the objective, the enemy lobbed hand grenades at them, but, that could not stop Chuna Ram. He charged the enemy post with a sten gun. He killed two and wounded three enemy soldiers and silenced the guns. He was bleeding profusely from his wounds but he continued till he became unconscious.